Thanks to @SailorHannibal for this art piece! Admittedly, it was really fun to get to track some of our old school stats, like Scanlan’s songs and the number of times Matt said ‘proper’ (probably because he only said it twice. We love you, Matt!). Back in July following The Mighty Nein’s encounter against the Gearkeeper, we (along with some other critters) started wondering about how many death saves have been made throughout Critical Role’s tenure. And, us being us, we decided to go through our documentation and see what we could find. Unfortunately, by the time we finished our research, a certain in-game event made publishing it less than tasteful at the time, and it’s been sitting on our back burners ever since. However, thanks to last week’s Handbooker Helper, we were reminded to dust it off and update it! Here are those results, updated to episode 2-36. Spoilers for Campaigns 1 and 2! Thanks to @delsinsfire for this art piece! Last, but not least, we honor the ridiculous and epic moments Vox Machina had as a group. Thanks to @mathilde_draws for this art piece! 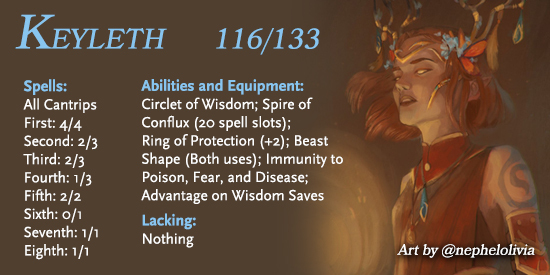 Two points’a Heroes’ Feast, plus from Keyleth: nineteen! So Grog’ll slice, Sword of Kas, that lich ‘til they’re free! 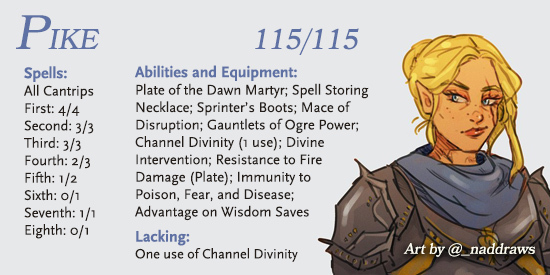 Do you have a list of all the deities mentioned in Critical Role, or the blessings each party member has received so far? Thanks to @rilaisseth for this art piece! Now that we’ve hit 100 episodes and most everyone is at level 17, we figured it was time for an update of one of our favorite stats: Max Damages. As usual, this is the maximum damage each character can deal to a single target in a single turn, assuming they roll the highest number on every die and crit whenever possible. Using spells or effects cast in a previous turn is allowed, but we’re not taking environmental hazards (like lava or acid) or conditions (like storms) into account. We also assume that the target has no special vulnerabilities, and if there is a save, the target fails. For the sake of everyone’s sanity, we’re not allowing spells like Conjure Animals, because that gets game-breaking and complicated rather quickly. 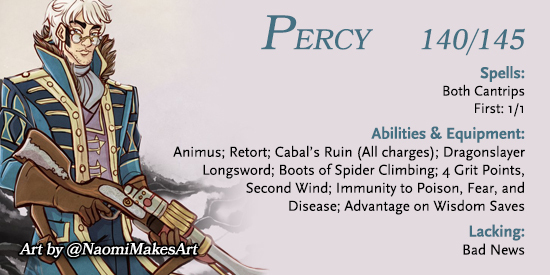 Otherwise, we follow Critical Role’s homebrewed spellcasting rules, which allows two spells to be cast in a turn, as long as one is 2nd level or lower (this doesn’t prevent the casting of a high level spell in a previous round to be used as a bonus action with another high level spell cast as an action). 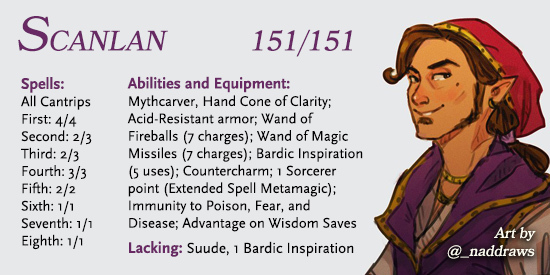 We’re including both Taryon and Scanlan here, but it’s possible that both characters have things that we don’t know about, especially since we’re not even close to confirming Scanlan’s full level 17 spell list (he potentially has access to every 9th level spell in the game right now, which is a little bit terrifying).